Restrictive gastric operations, such as vertical banded gastroplasty (VGB), serve only to restrict and decrease food intake and do not interfere with the normal digestive process. In this procedure the upper stomach near the esophagus is stapled vertically to create a small pouch along the inner curve of the stomach. 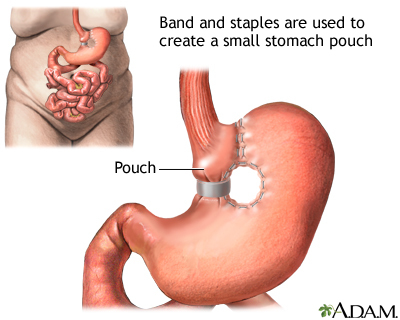 The outlet from the pouch to the rest of the stomach is restricted by a band made of special material. The band delays the emptying of food from the pouch, causing a feeling of fullness.